At Hershocks, Inc., our Residential Department has what your home needs – quality products and services that will add beauty and value to your home. 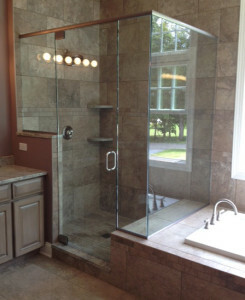 Items include garage doors, glass shower enclosures, and mirrors. Our professional sales staff always asks the right questions and takes the time necessary to make sure they understand your particular situation. Using their extensive product knowledge and drawing from their experience within the field, our sales consultants’ recommendations will be based on the solution that will work best for you. In an industry where most businesses are short-lived, Hershocks’ dynamic approach has created a proven track record for over 80 years. Our Residential coverage in Central Pennsylvania includes Dauphin County, Cumberland County and Perry County. Considered today’s greatest escape, many people are choosing to transform their bathrooms into luxurious spa-like retreats. More and more homeowners are rejuvenating both their bodies and minds by stepping into a custom luxury glass enclosed shower environment decorated with ornamental tile that features multi-function showerheads, body sprays, and jets, state-of-the-art thermostat controls and steam units. The streamlined sleek look of a custom shower enclosure can be complimented with an array of hinges, pulls, and towel bars available in various elegant finishes that perfectly complement any bathroom décor. Three styles of safety-tempered glass allow for a variety of sophisticated design options. Glass options include clear, tinted, and transparent or decorative translucent options. Guardian ShowerGuard glass is also available to seal glass and virtually eliminate corrosion. If you are looking for a new garage door, garage door opener, garage door replacement or garage door repair service on your existing overhead or garage door, Hershocks is your first choice. First impressions are lasting impressions. Your garage door can represent up to 40% of your home’s exterior, which makes it a vital part of your home’s design. It is important to choose a door that is both durable and complementary to your home. 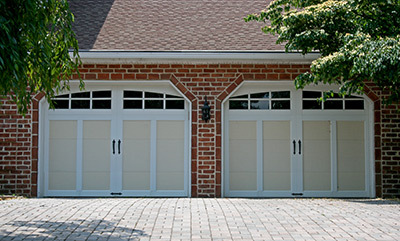 The garage door should do two things: look great and operate flawlessly. Hershocks offers a full line of Clopay garage doors and LiftMaster® garage door openers designed for beautiful, long-lasting performance.